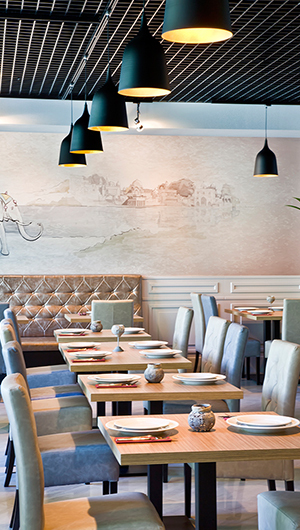 Bombaj Masala Mokotow restaurant was born from a passion to share the taste of incredible Indian food. The venue was decorated to blend modern architectural elements with traditional Indian ornaments. This unique restaurant allows our Guests to watch the art of Indian cooking thanks to the open kitchen. We cater for all occasions so your breakfast, business lunch or a romantic dinner will be a totally different experience. Our professional and well trained team will introduce You to the delights of the Indian cuisine and will help you choose dishes and drinks to suit your individual taste. To make sure your experience is complete, we have built an outside patio seating area and a children’s corner full of toys and activities for your little ones. We also offer seasonal promotions and loyalty discount cards.